What If My Voice Doesn’t Matter? As the week has played out, I’ve been left to wonder whether simply having the conversation is enough. Many students, in our classroom conversations, have revealed that they feel disengaged because they don’t think their ideas matter. They’re not apathetic—that is, it’s not that they don’t care—but rather that they’re resigned to live in world in which decisions are made by other people and they can have little influence. It’s a sobering reminder. The teach-in is premised on the idea of bringing together our course materials and topics related to Black Lives Matter. Both of my courses participated in the teach-in—the first half of the US history survey, and an upper-level course on Native American history. It feels a bit like I’m cheating (at least compared to some colleagues), as I haven’t had to make many changes to my syllabus to accommodate a discussion of race into the lesson plan. But race and slavery are central to understanding early American history, so it’s important for students to get a sense of that both on its own and within the context of the discussions they may be having in other courses. I’d been looking forward to hearing what my students had to say about Black Lives Matter and the teach-in, but something weird happened on Tuesday that has me thinking deeply about how we approach issues from the outside world in a university setting. In the survey course (mostly populated with non-majors, with a plurality of first-year students), I gave a brief lecture on slavery and freedom in colonial America, then we discussed a few readings, including an excerpt of Olaudah Equiano’s narrative and some runaway slave advertisements. Then I opened the floor to conversation about connections between early America and Black Lives Matter, and was met with near silence. A few students offered tentative thoughts, seemingly wary of offending their fellow students. Two-thirds of the students said they hadn’t. That stunned me (as well as several of the students in the class who were familiar with it). They were not even aware of it, which means that they hadn’t heard anything about the movement or the counter-protests that had developed. They just didn’t know. So instead of discussing Black Lives Matter, we ended up having a conversation about news consumption habits, mostly through Q&A. Most of them don’t go to news websites, and many don’t even get much news through their social media feeds. They just aren’t looking for world, national, or local news. I will admit that I sometimes have difficulty understanding how that’s possible, but I recognize that as a politics and media junkie I am not anywhere near normal when it comes to this issue. For two days, then, I’ve been thinking more deeply than ever before about ways to address the chasm that divides our vision for students to engage in civic life and their lack of motivation. I think their voice matters, and I know that it can if they raise it often enough. But I can’t just order them to have conversations about civic life (I do cajole on occasion). There are a few things I’m considering for my course this semester, including bringing up current events more frequently and possibly adjusting a future paper assignment to ask students to think about the American past in a contemporary context. But there’s so much more to be done than just that to motivate and energize our students to think that their ideas, their voices make a difference, and (if all goes well) to connect their university education to their lives outside the classroom and beyond campus. 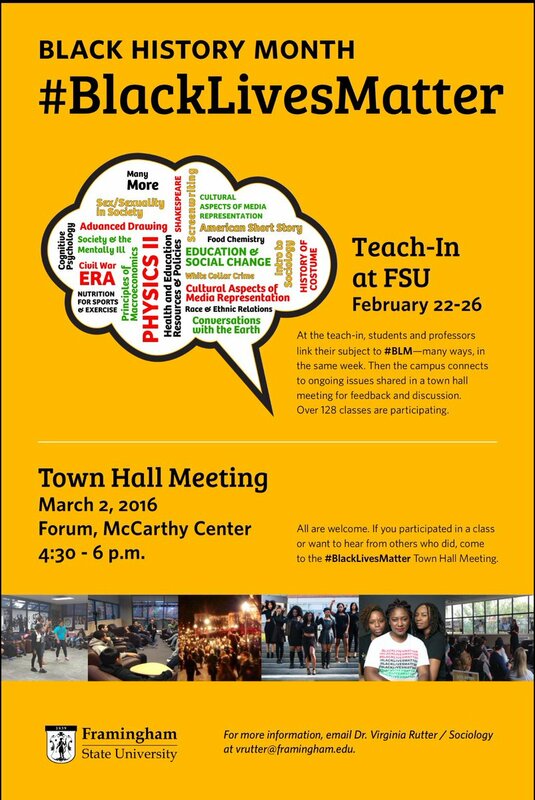 Note: Students and faculty have been using the hashtag #BLMatFSU to continue the conversation on social media.